How is it possible that medicines intended to cure disease or relieve symptoms in humans may under certain conditions cause harm to the environment? Two conditions acting together may make it happen. Firstly, medicines or their residues may reach the environment, i.e. air, water, or ground. Secondly, there are living organisms in the environment, which will react negatively when, exposed to these medicines. This article will briefly discuss the background to an issue, which needs serious considerations.The most common route for human medicines into the environment is probably via normal use in patients taking their medicine. Some medicines are not degraded while acting in the patient. Among the many medicines used in health care some are degraded completely in the patient, others will only be degraded to some extent, and some will be intact when excreted from the body. If the treated patient utilizes a toilet connected to a sewage system ending up with a sewage treatment plant some, but not all, of the medicines reaching the plant will be degraded, fully or partly, before being discharged into the receiving surface waters. The surface water may be attached to a creek, a river, a lake, or the ocean. Even modern sewage treatment plants usually lack specific procedures to eliminate medicine residues. Plants with less sophisticated methods may more or less allow the medicine residues reaching the facility to pass unaffected before being released into the environment. Therefore, surface waters in most countries contain trace amounts of several pharmaceuticals. If unused or expired medicines are discarded into the toilet or sewage sink, they will undergo the same fate as those excreted the normal way from the patients. Another source of pharmaceuticals in the environment is from production site outlets. 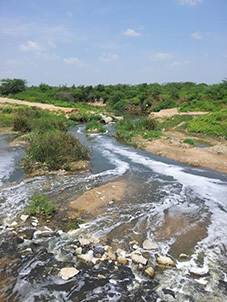 Some manufacturers have modern treatment plants eliminating virtually all medicines or byproducts from their sewage water, while others display serious deficiencies in this respect. Besides outlets of medicine residues to surface water, emissions may also take place into the air (from production or regular use) or soil (mainly from medicines used in the breeding of animals, including fish and shellfish). How can medicine residues act in other living organisms than humans? The answer is simple: all living organisms – humans, all animals, plants and trees, microorganisms like algae, bacteria and fungi – are developed from the same primitive type of cell appearing on Earth around 3 billion years ago. From this original cell type, all living organisms have inherited certain common features. Therefore, humans share a certain amount of genetic material, even with primitive organisms like bacteria. This conformity of genetic inheritance makes it possible for other living organisms than humans to react to human medicines. It has in fact even been reported that growth of some plants may be sensitive to human medicines. Evolution has allowed living organisms to develop in different directions. Consequently responses to medicines intended for human use may differ between humans and other species. Fish exposed to a certain type of medicine regulating human blood pressure may react with impaired reproduction potential. Shellfish need intact cholesterol synthesis to build up their shell, while cholesterol synthesis inhibition is a frequent method to control blood lipids in humans. Thus, if shellfish are exposed to a blood lipid lowering medicine intended for human use they might develop defective shells. The most important negative environmental effect of human medicines is probably the feminization of male fish, tadpoles, and other aquatic organisms, caused by natural and synthetic estrogens. The feminized males display impaired or inhibited formation of sperm cells. Such a negative effect may pose a threat to the reproduction of the species and thereby in the end impair its survival. A dramatic consequence of medicines finding their way into the environment is the diclofenac disaster in India and Pakistan. 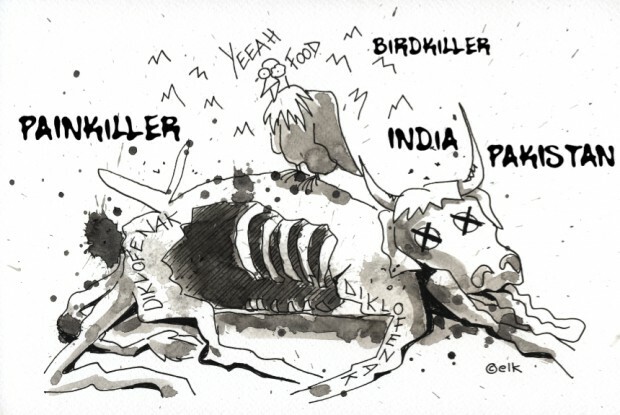 In these countries, some strains of vultures have been close to being eradicated following intake of carcass tissue from cattle treated with diclofenac. The vultures cannot excrete this medicine, which destroys their kidneys, and the consequence is that they die from uremia. Due to the cultural tradition in e.g. India and Pakistan”holy cows” are allowed to die naturally, giving vultures the possibility to eat the carcasses with remaining residues of diclofenac. Although the resulting ornithological catastrophe may be considered a unique curiosity it clearly shows the difficulty in foreseeing which medicines, which living organisms and their effect on the environment that may lead to environmental disasters capable of eliminating whole strains of living organisms.